The awkwardness of using those public or shared shower rooms while out on our camping trip, if only there was an easier way.. Camping shower tents are sorely overlooked, and are one of the most, if not the most practical utility tents out there. With the new pop up designs, portable shower enclosures take up significantly less space as traditional outdoor tents. Nowadays they fold up to the thickness of a pizza, weigh a few pounds and can be stored easily along with your other gear. Showering and using the toilet while camping is no longer a hassle and staying clean has never been easier. With a 60 second pitch on, you’re ready for a refreshing wash in minutes. However, there are a few rules and regs we should follow to maintain hygiene while out in the wild. Forget all those sticky nights and smelly clothes, having a good scrub at the end of a long day will help you rest easy, and sleep deeply. Waking up invigorated after a good rest, ready for the next day of activities. 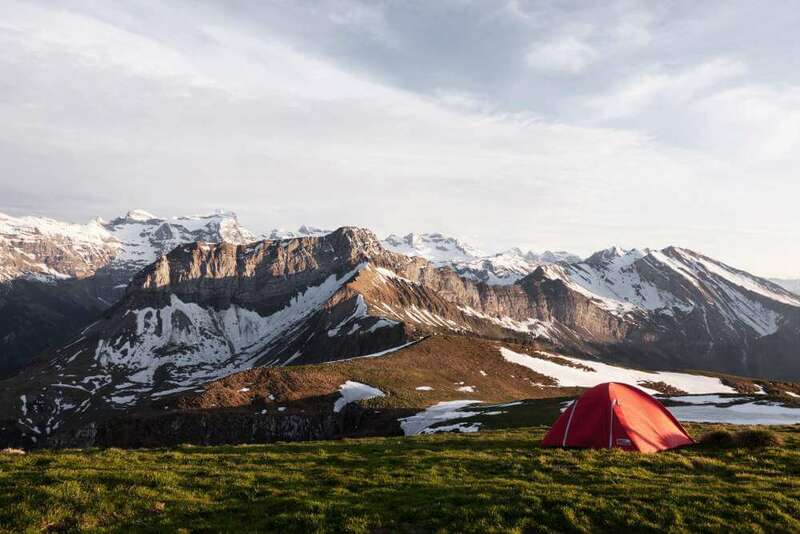 We’re going to review fully the best camping shower tents available on today’s market, the different kinds of shower tents from pop ups, instant set up and 2 room models. 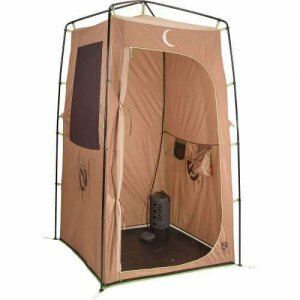 An excellent 2 room utility tent that has an abundance of cool features and comes with a free 5 gallon solar shower. It’s designed to be used as a shower and changing room, with its 2 room feature. Let’s check out why this is a best seller. Every door and entry panel is completely sealed. The zippers are durable and waterproof and stops wet or condensation seeping into the other compartments. Any hot air is able to escape easily through the rooftop and the water drains off through the meshed floor area. The 2nd room can be used as a porta-potty room if camping with children. 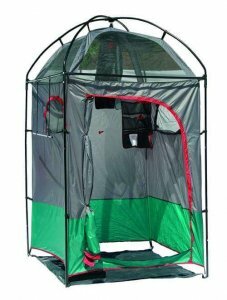 It includes a 5 gallon portable solar shower, which is easily attached onto the loop integrated inside the shower tent. This means you can also attach your own portable shower accordingly. The solar bag is a nice gesture, but a powered or pressured shower is more ideal for camping with bigger groups. There are multiple storage pockets, which provides convenience when washing and room to store all your toiletries and shower paraphernalia. It also has a towel rod feature, so you can hang your towels or wet clothes up while enjoying a nice hot shower. A pre attached frame that assembles by simply extending outwards and staking to the ground, provides an instant set up. The walls also have been coated with a silver aluminum coating, this serves as an excellent reflective style cover, leaving nothing transparent. The shower tent also has 2 windows, which can open fully by unzipping and rolling them down. This allows you to completely ventilate the rooms after showering. Priced at the higher end of the spectrum. 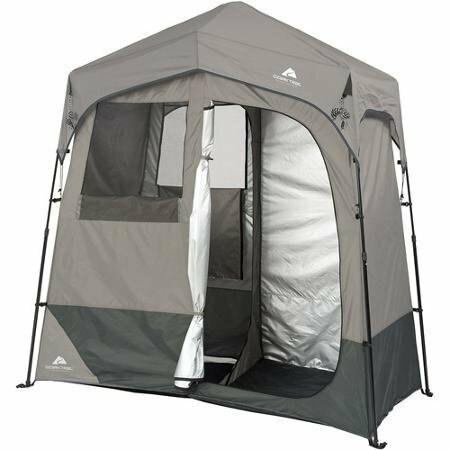 A well designed 2 room shower tent that matches all competition and more. 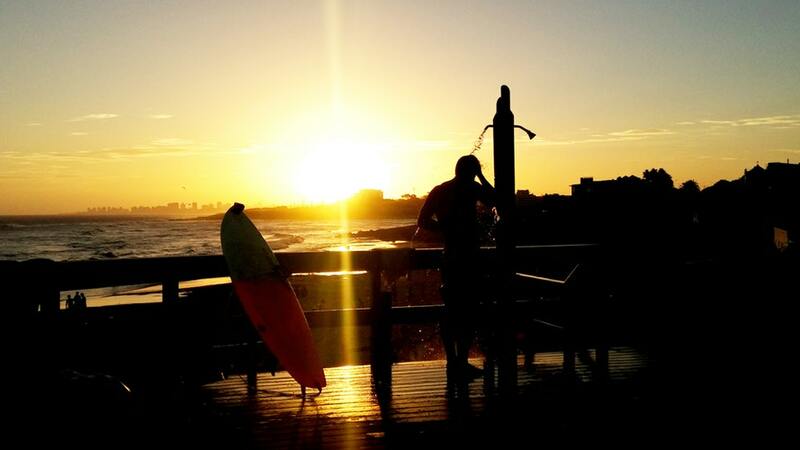 Quality rainfly, large interior, water resistant fabric and a host of other features. Let’s find out why this is a great choice. There are 2 large rooms with dimensions of 3.5 x 3.5 foot with a tall center height of 7 foot. Allowing space for everyone to stand up freely inside both rooms. They are separated by a large D Shaped door which has a durable zipper integrated, providing privacy between compartments. There is also a lock for the zipper so you can store things inside securely. Well ventilated by way of mesh. The roof has a mesh vent which allows the hot air and steam to escape. This greatly aids in circulation and clears the tent of condensation quickly. Additionally it helps you to air it out and dry quickly before packing away. There are features for storage, including a clothesline that has been attached already to the framework and enables you to hang wet towels or clothes etc. Storage pockets hang from the interior, you can use this to store shower amenities or other small possessions. You could also attach a camping shower caddy inside for extra space. CORE tents have integrated their H20 Block technology into the shower tent, just like with their Instant Tents. This means it will be protected from not only the sun with a 50+ UV protection, but also will be waterproof with the seams being taped. Being premium it’s one of the more expensive products on the market for shower tents. Next up is a pop up shower tent from Quictent. It features double rooms, a few color choices and a full warranty. With a thick fabric canvas, lightweight aluminium poles and efficient design for easy assembly, it has become one of the best quality options. The pitch is incredibly easy and this is mostly down to the design of this model. Utilizing an automatic rod bracket which allows you to spring the frame into place and click to secure within a minuter or 2. In-fact you can set up and take it back down again in around 5 minutes tops, without the need of any tools or equipment. Using a thick canvas for the tents material in the form of a silver coated Oxford fabric. Oxford is widely used and is proven to be waterproof and with the silver coating, it can ensure full UV protection. Also known to be more environmentally friendly, using less chemicals in the production and coating process. The poles in the frame have been strengthened since previous models. This time around they have been designed with a 9.5mm thickness. Only the leg poles are aluminum, the frame itself is fiberglass. There is ventilation in the form of a central hole, allowing hot air to escape. This stops condensation forming, speeding up the packing away process. A self draining system is present at the bottom with water outlets on each sidewall, this will help to keep the floor dry after showers, alleviating slippage and mildew buildup. We rate this portable shower tent for its simplicity and think it’s worth a look at. With quite a few features that are practical and some dimensions that match CORE and Quictent, it has our attention. Made with 210T Polyester fabric that is protected additionally with a silver coating that works to counter the suns UV rays. This material is also waterproof, so you don’t have to worry about rain penetration. With a steel wire frame its extremely lightweight. It employs the pop up design for assembly, so you can have it up and ready within minutes. It’s just as easily folded back into its storage bag also, which comes free with it. The shower room has storage facilities to keep your amenities safe and off the floor. It has pockets to keep your things safe and an organizer in both rooms. An O-Ring made of metal is the attachment you can use to install a portable shower unit. With a center height of just under 7 feet, the total dimensions are around 94.5 x 47 x 82 in inches for length, width and height respectively. Easily enough space for 2 people to use each room. A popular lightweight, fast pitch shower tent, which also can serve as a privacy tent or portable changing room. Single roomed design however the interior is very spacious, with plenty of room for anyone to move around. Simple assembly method, combined with a cool hiking style design makes this model from Lightspeed a great choice for all campers and lightweight enthusiasts. With pre-attached frame and pre-threaded poles, this is an absolute breeze to set up. It’s very light also, weighing only 16 pounds. This is the lightest shower tent we’ve seen on the market. Making it an excellent choice for hiking and camping trips. Its dimensions are around 5x5x7 in width, diameter and height. A few nice features such as the large D Shaped door and 800mm PU coated fabric making it wet weather worthy. Internally it has some practical features such as the towel strap to hang your towel, storage pockets and a shelf to store your shower bag. It also has meshed rooftop windows, 2 to be exact, which allows the steam to rise and escape. It doesn’t come with a solar shower bag like some other models and more importantly, it cannot hold a 5 gallon shower bag. This is too much weight for the lightweight frame to handle, it will bend with this weight. For best use, use a lighter bag, such as a 1, 2 or 3 gallon. 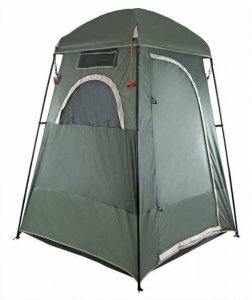 Robust and spacious are the main features of this heavy duty, camping shower tent. A sturdy frame which supports a 5 gallon shower bag or shower unit. Ventilated, multi-functional with many practical features, let’s look closer at this great shower tent. On the outside it has a large pocket which is split into 2 sections. Also a rope which you can hang your towels on to let them dry. Internally, it has another large pocket, but this time it’s separated into 4 compartments, for smaller condiments. The windows are double layered and they have integrated 2 of them onto the tents side panels. Fitted with fine mesh, it keeps the creepy crawlies out. The windows can also be closed fully, blocking any visibility, serving as privacy panels. A shower bag can be attached internally. You just loop the showers handle through the integrated hook, and connect the two hooks together. Its sturdy frame holds a 5 gallon bag easily. 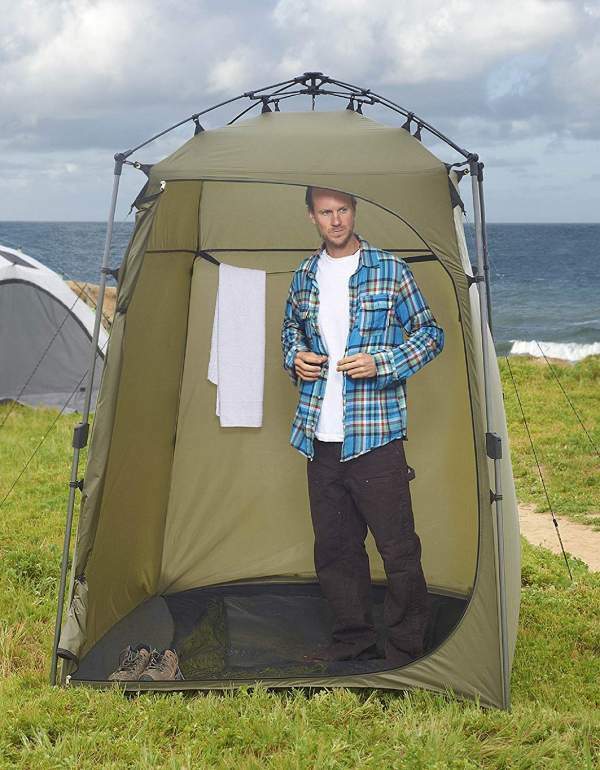 A great choice for a family shower tent during a camping trip. 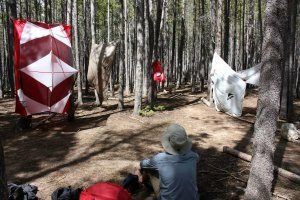 So now that is our list out of the way, let’s take a look at some important questions that are often asked when buying a camping shower tent. A cheap and cheerful pop up model that sets up within 60 seconds, is lightweight and collapses very easily at the end of its use. It makes for a great quick pitch enclosure to get changed or have a quick wash with your shower bag. However, that’s all you will be able to mount, is a light shower bag, between 1-3 gallons for example. The heavier 5 gallon bags would require a sturdier frame and build. The fabric consists of taffeta polyester which has been waterproofed and the floor is an open bottom. In this case a bamboo shower mat would be an excellent accessory, to prevent a muddy build up beneath. There is a large access door that is zippered, so you can secure for privacy during a wash. The tent stands at 75 x 47 x 47 in inches, comes free with 4 stakes for mounting and can be folded down and carried in its nylon carry bag. All in all a good choice for a makeshift or temporary use. 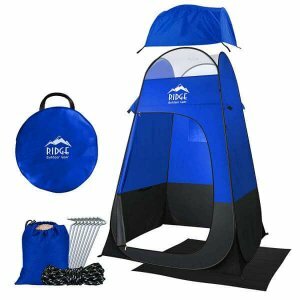 Another pop up shower tent, this time from Ridge Outdoor Gear. As you can see from the picture this is a very well priced and equally good valued choice. At around $50 its positioned well in the middle of the market, however the tent comes with a host of goodies and features, which really adds value. 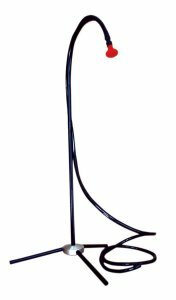 It’s center height is a valid benefit, standing at 6.5 ft tall and it is also compatible with portable shower units, due to the attachment for shower heads. 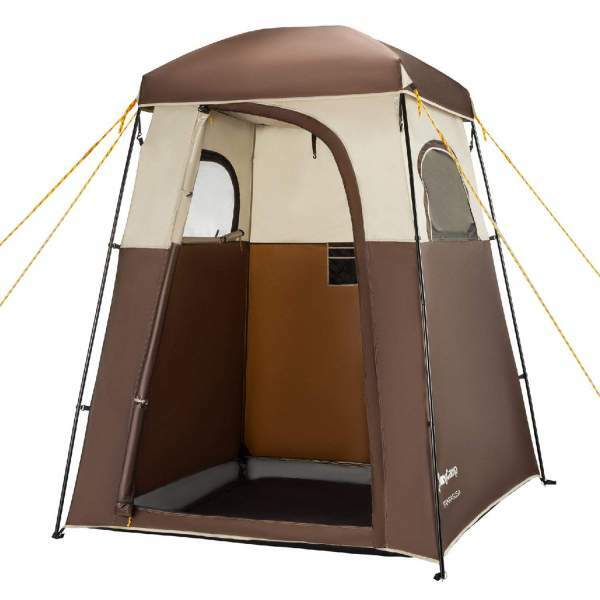 Ventilated well by way of a large window and mesh roof area, that allows the tent to breath. A host of other cool features such as storage pockets, paper holder, lamp or shower head hook. Additionally it comes with free sandbag weights, which can help to secure it. However, remember it is a pop up model, so it will not fare well in strong weather conditions. It is a few inches taller than the Wolfwise, around 3-4 inches. A rain-fly and groundsheet also are thrown in, which will help to protect against rainfall if being used as a changing room, shelter etc. As a pop up it is comparable to Wolfwise, but for the extra price you can enjoy more features and a free bundle to match. Note this model does not come with a shower, but it is compatible with shower units and bags like. It is sturdy enough to hold a 5 gallon. A nice feature of this model is the removable floor, so it can double as a changing room when needed. The material is fairly durable and non-transparent, providing ample privacy when changing or showering inside. A very versatile tent given the simple set up, allowing you to pitch on sand, soft ground or concrete alike. Dimensions are 55 x 55 x 86.5, so its head height is higher than the Wolfwise and Ridge models. It’s also very light to carry, weighing in around 13 pounds which can be carried within its storage bag. This tubular blow up model is a good option if you want to save a few bucks or just want a temporary shower enclosure for the occasional trip. It doesn’t require much assembly at all and the corners are inflatable, which can be easier or more difficult depending on your preference. If you already use an air tent and have a pump, it could be convenient. This can be used in any scenario, but the difficulty lies in the support. It needs to be secured from the top as well as the bottom. The bottom is easy, you just stake it like you would a regular shower tent. However the top must also be secured on some low bearing branch or beam, like a canopy for example. There is large side entry access and it’s around 6 feet tall in total, there is no roof or floor in a tubular design. Easily set up by inflation into the air chambers and all assembly pieces come free. A cheap, temporary model that does the job, but its not without its drawbacks. 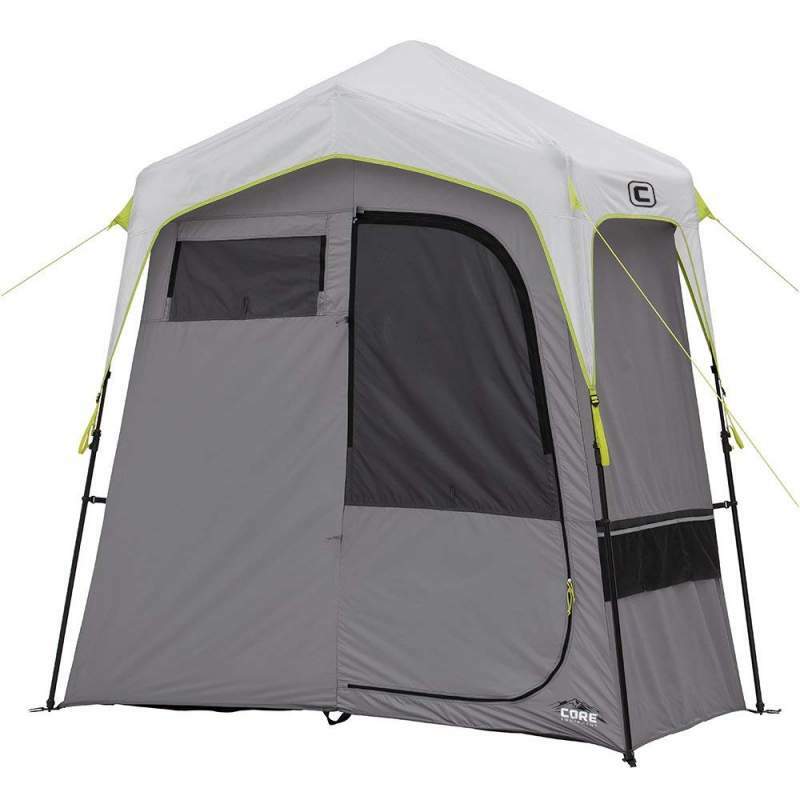 One of the largest 1 room shower tents on the market, standing at 66 x 66 x 86, the Cabana range from Stansport are top quality and provide very generous space inside. The fabric is Polyester and Nylon made with 190D, which protects the tent from rainfall and water penetration. Given the huge interior, it is versatile and can be used for a porta potty, changing room or attaching a portable shower unit. Due to the large frame, a 5 gallon bag is easily attached. The lightweight framework is due to the fiberglass poles used, easily carried, but as we know fiberglass isn’t the strongest in comparison to aluminum and steel. But it is the lightest, which is great when you are on the move. Additionally it has storage pockets, a stuff bag and is ventilated well with 2 U shaped windows that give easy access to the external storage pockets. A premium choice from Nemo, this is a fantastic option which is compatible with camping shower units. Nemo have their own range of units, such as the Nemo Helio, which can be used with this due to the roof attachment and the tall 84 inch head height. Among many other similar camping showers. A robust steel frame provides more endurance compared to the fiberglass and aluminium models, additionally it has been hub welded. A door lock mechanism has been employed to create a better feel for privacy when showering. Some features include an overhead storage and dispenser. Our favorite feature is the floor, made of durable HDPE material, it also has a drain-off feature so water is unable to form pools/puddles on the floor. Our last model is a heavy duty and durable option with a reasonable price around $75. Which is great value when you consider it comes with a free 5 gallon shower bag and shower head. The frame is steel, rust resistant and has clips to help strengthen the joints and weak areas. Another unique feature here is that the material is flame retardant with CPAI-84 rating. A large zippered door, utilizing Polyurethane, creates the access to the tent and a removable rip-stop panel that has 4 drain-off points in each corner, creates the floor. Well ventilated with 2 ‘no see um’ windows, which basically means they provide full privacy while behind them, which are made with a meshed material. Storage pockets and racks provide the space needed to store your shower things and shower unit. The floor does have gaps around the base, it doesn’t fit tightly to the tent, not a great problem but worth knowing. What is a Shower Tent? It’s a quick pitch, portable enclosure that includes 1 room or 2 roomed options. Internally it will have some attachments to secure a portable shower, additionally it will have waterproof material. With these features combined its possible to enjoy private showers while out on your camping trip. 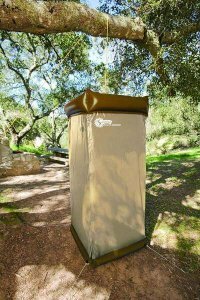 Shower tents generally hold up to 10-25kg depending on the size and model, making it possible to attach 3-5 gallon shower bags, but also propane or battery powered shower units. How to Pitch a Shower Tent? With pre-attached frameworks, you just pull the center hub upwards to expand the frame. When the frame has expanded far enough the locking system will click into place, the framework will now be fixed. You can then proceed to secure tent stakes and guy-lines where necessary. 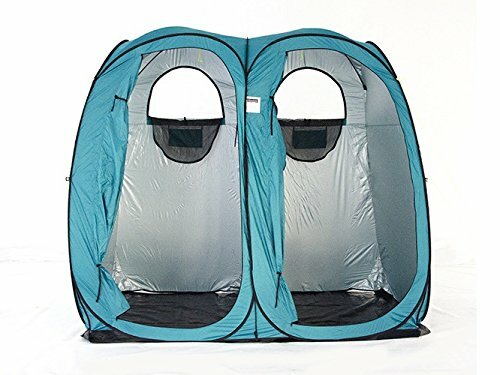 Pop up shower tents are even easier, you just throw them into the air after unpacking, they will explode or ‘pop’ into shape automatically, again and stake and secure guy-lines accordingly. All in all a very simple process that is fast and efficient in both set up and folding, lets look into the folding method. 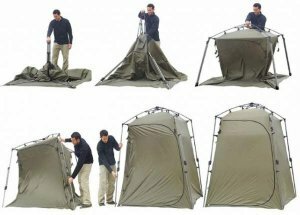 How to Fold a Shower Tent? To fold the shower tent first you must detach all stakes and lines and lay it flat. The. Once it’s flat you can grasp it on both sides, towards the base of the tent. After, you pull it upwards towards the sky. At the same time as your hands are coming together, dip your left hand under your right hand, this will create a coil effect. You then grab the top end which is coiled underneath and bring it up to meet the base, this will fold the coil and create a flat disc shape. Once you have the disc shape firmly in your hand, you can proceed to store it in its carry bag or sleeve, depending on the model. 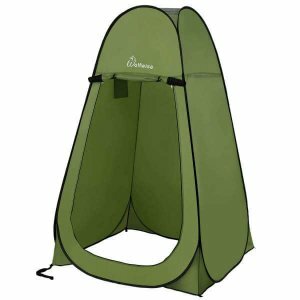 What can I use with a Shower Tent? 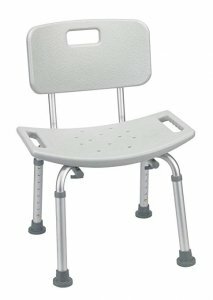 If you have any group members in need of some support during shower time, they have some great camping shower chairs available. They are travel style chairs because they are foldable and lightweight. This one for example is an excellent choice as it’s capable of holding up to 300lbs in weight. With an aluminum frame it’s also very easy to carry and folds up neatly, taking up little space. Another cool feature is the drainage holes on top of the seat, this helps the water to flow through the chair and onto the ground, to be drained off. 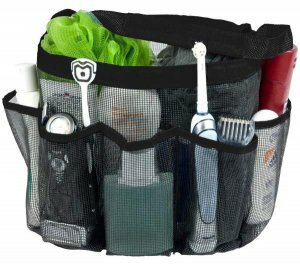 Another nice accessory is a camping shower caddy. They can attach onto the shower tent easily and act as a second storage compartment for your shower stuff. A shower tray or shower mat is also a really good idea to put on the base of your shower tent, especially if it is without a floor lining, its a good way to stop the ground getting boggy, which is horrible to stand in. 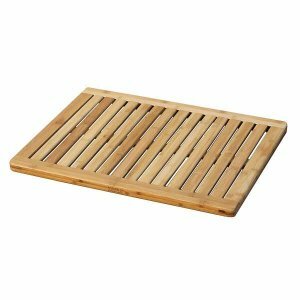 This particular shower mat is made of bamboo, making it economical, environmentally friendly and durable. Position it directly below the shower head to give you leverage of the soggy ground and to prevent any slips. 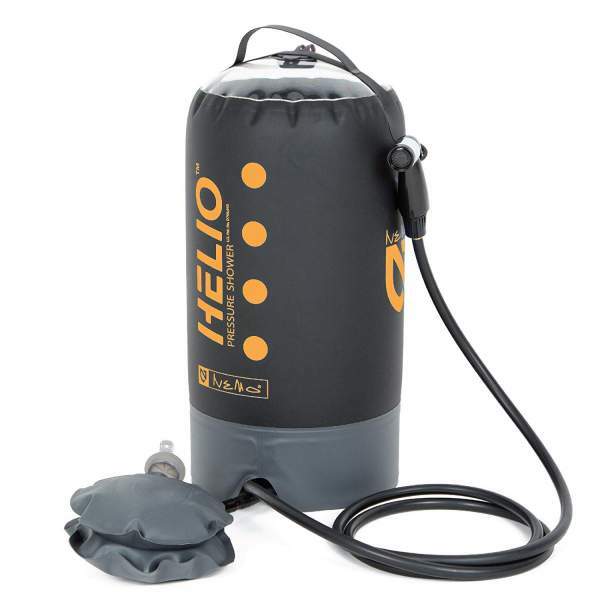 These work really well near the beach or campsite for a rinse off. Simply run the hose up the backside of the tripod stand and attach the shower head at the tip. You can enjoy a real shower without holding the head or bag yourself. How to Maintain my Shower Tent? After your camping trip is finished. 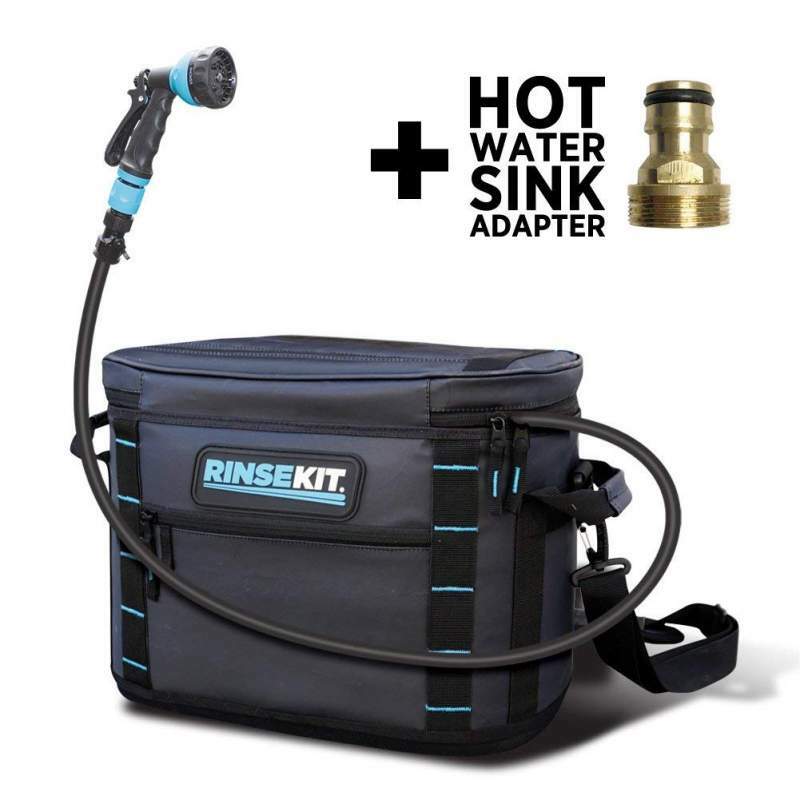 Start with the rinse off, you can use your portable shower or RinseKit to clean all the dirt and grime from the interior and exterior. Leave it out to dry if you have time, if not just towel it down. Make sure it’s dry before folding to stop any buildup of moss and mildew while stored in its carry bag. All in all, shower tents are the new trend in camping for a reason. They are insanely easy to set up, can hold a solar shower bag and also be compatible with portable shower units. Lightweight and a breeze to carry, they can fit in with your camping gear easily. 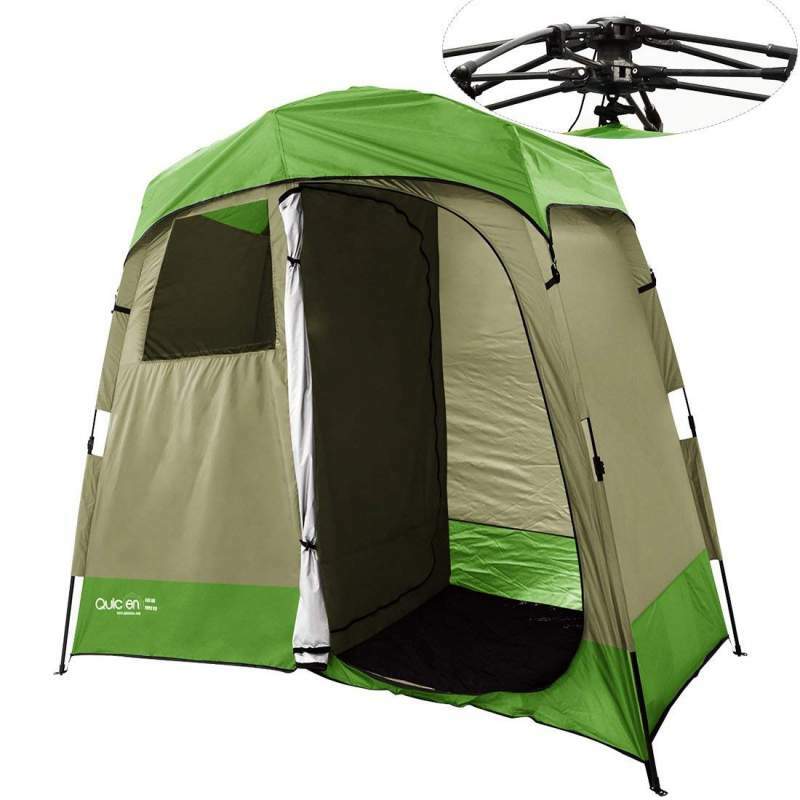 Customizable also with a variety of additions and improvements, they should become a part of your foundation camping set up. Battling against hygiene and cleanliness is a thing of the past, thanks to these modern creations, welcome to camping in 2019 people. We hope you enjoyed this article, please feel free to share the article if you found it interesting. Likewise drop a comment below if you have any questions.